In the summer of 2003, I began working on a new arts and entertainment magazine called Upstage. One of the very first features was on a band called 4 Way Street from Philadelphia who was putting out their debut album and had a show coming up at The Saint in Asbury Park. 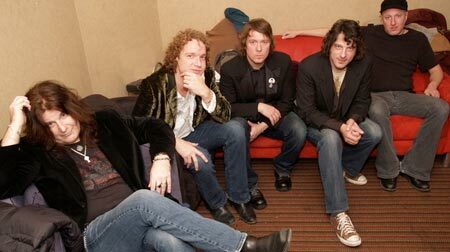 Comprised of Ben Arnold, Scott Bricklin, Joseph Parsons, Jim Boggia, and Matt Muir, the band was sort of a Philadelphia supergroup of area singer-songwriters. They had a sound that reminded me of Crosby, Stills, and Nash and I jumped at the opportunity to get them in the first issue. I'll never forget my first trek out to Philly to interview the guys in the band. They were holding their CD release party at the TLA (Theatre of Living Arts). For some ridiculous reason I decided to take the train to Philly that day. Now, there really isn't a train from the Jersey Shore to Philly, but you can get there if you make enough transfers. So, I wound up leaving around 10am and took the train from Belmar to Long Branch, hopped on the Long Branch train heading north to Rahway, switched on to the train from Rahway to Trenton, and finally took the Trenton train to the SEPTA line and headed into Philly. The whole trip took probably about three hours -- far longer than I thought it would be, but I got there just after 1pm or so and headed to the TLA. When I arrived at the venue, there was a sign on the door, "Show cancelled due to Hurricane Isabel." That note sort of freaked me out because I had no idea there was a hurricane coming. It also meant I was stuck in Philly for at least three hours until the next train. I hung out in the Irish bar next door, ordered some lunch, and passed the time while a skinhead and another guy were arguing and extremely close to bringing out the fists. It was a good cheesesteak if I recall, but one of the scariest meals I've ever had and one of the most interesting conversations I've ever overheard. A few weeks later, 4 Way Street had their record release party at the TLA and I was back to interview them. The guys were among the coolest musicians I had ever interviewed and I've managed to stay in touch with them ever since. The band's name has changed to U.S. Rails, but it's basically the same lineup with the exception of Tom Gillam replacing Jim Boggia. Musically, they may have veered a little more towards a country influence, but the harmonies and original vibe is still there. In fact, the first U.S. Rails album may have been even better than the lone 4 Way Street release, which is saying a lot because I loved (and still love) that record. On Thursday, September 1, U.S. Rails makes a rare return to The Saint. It's rare because the members of the band are literally scattered across the globe these days. What started out as a bunch of Philly area locals now has members who call Germany (Joseph Parsons), Paris (Scott Bricklin), and Austin, TX (Tom Gillam) home. So, your opportunities to see them all together live at the same time are pretty limited. The Asbury Park show is part of a mini-tour (mostly PA, DE, and NJ) offering a 'sneak preview' of the band's upcoming album. But according to Ben Arnold, it's a bit more than a sneak preview. The band will be playing a mix of old songs and new, but will mostly lean on tunes from the new record. "The album 'Southern Canon' is available now at all of these shows, but not on iTunes or anywhere else for that matter until it is officially released worldwide by Blue Rose Records in January 2012," explained Arnold. "We all contributed and collaborated on this one. (In fact) more than the last as well as more than even on the old 4 Way Street record. It was cut at the end of our tour in Europe last October in Germany. "Everybody has their own strengths and weaknesses," he continued. "We all share, if not the same musical background, than the same interest in performing, writing, and recording. We're all a little older and have been there and back, so to speak and, at this point just enjoy each others company, the travel and finding and building a small worldwide audience. This tour has especially surprised us with the number of people who still care about what we're doing. We are really looking forward to Asbury. Scott and the club has always made us feel at home and our NYC show was cancelled so we're hoping some of those folks will make the trip out." One of the new aspects of launching a tour like this with everyone coming from all over the world involved making sure everyone had a place to sleep. In the early days of the band, when they all lived within the Philly area, they never had to consider such things. As the days got closer and they still hadn't finalized their plans, they even reached out to their friends on Facebook for help. Arnold says their search didn't go so well initially, but, in the end, they all found beds. "It is definitely one of the things we didn't think about before the tour," he added. "Fortunately, we have friends." Even though they're only playing a handful of dates, they managed to get some pretty good gigs on this tour including singing the national anthem at a Phillies game at Citizens Bank Park and playing the Philadelphia Folk Festival. "Citizens Bank Park was a fave," said Arnold. "All the dates are spread out among smaller clubs in which we have history and we want their continued support. We generally received a lot of support from anyone we contacted and the shows have almost all gone great. And we have a 6 week tour in Europe coming up in January and February of the coming year." With Scott and Joseph living abroad and Tom down in Texas, I asked Ben if he's ever considered leaving the City of Brotherly Love. "I am tempted several times a year, several times a day on some days! But, in the end, I have a fan base and a network of friends and a community I am supported by." Here's hoping that some of those friends come out to Asbury Park on Thursday. I know I'll be there.